Mercedes has been providing its C-Class AMG versions from quite a long time and has shown improvement with running years. No doubts the luxury of Mercedes and sportive performance of AMG together created glorified benchmarks. 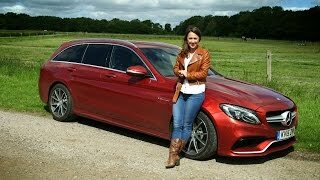 With this all new Mercedes-Benz C63 AMG Estate 2015 expectations definitely are high. Let us have a closer look and find out that apart from its 4.0 liter V8 biturbo beneath hood what all it brings with it. The interior of Mercedes Benz C63 AMG Estate will steal your attention with its bolstered sports seats, as you do not find many wagons with this feature. Apart from this the low positioned sports seats come wrapped in ARTICO leather and Dinamica microfiber made from hand. This eventually gives the tag of class to this model. Sporting luxury continues to spread its wings with a multi performance three spoke steering wheel hiding behind it carbon dials. This again turns to be a perfect amalgamation of class and sport. These aren’t enough where this rare combination could be noticed, cabin of Mercedes C63 AMG Estate within it brings a leather wrapped dashboards with crystal grey stitching adding to the contrast and yes not to be missed the same gets the ‘moon-mark’ upon it with the centrally located analogue clock. 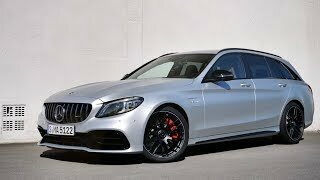 The exterior of Mercedes Benz C63 AMG Estate 2015 portrays a muscular profile and for this the anxious customers must give all credit to the aerodynamic kit AMG provided to this sedan with a hatch. Adding to the sporty profile of car are the redesigned bumpers, both at the rear and front end with front bumper incorporating a diffuser with three fins. Low ride height and the light alloy wheels get a commendable company of ‘V8 Biturbo’ and ‘AMG’ badges glued on front fenders and tailgate, leaving an unmatched impression while the entrance gets more enlightened with an all new grille, bringing the aggression to this entire C63 AMG Estate 2015. 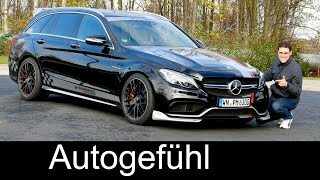 The performance of Mercedes C63 AMG Estate 2015 enthralls coming in two different trim level, both powered by a 4.0 liter V8 Biturbo namely; C63 and C63 S. While the C63 AMG comes with 476 hp and 650 nm torque, C63 S delivers 510 hp and 700 nm torque. Both these trims are paired to Seven-Speed automatic transmission with little variance in their racing specification. 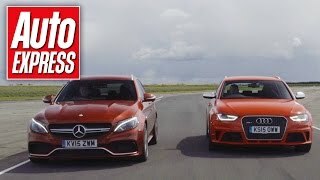 The C63 AMG is capable of touching the standstill to 62 mph in 4.1 seconds while the latter can touch the same mark in a little lesser 4.0 seconds, top speed for both the trims stand still at 155 mph.